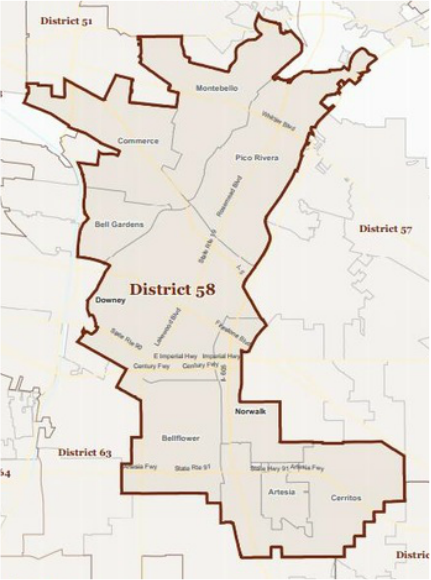 Democrat Cristina Garcia currently represents Assembly District 58 and will not be termed out until 2024. Garcia is expected to easily win re-election in 2016. Assemblymember Cristina Garcia was elected in November 2012 to represent and serve California’s 58th Assembly District, which includes the cities of Artesia, Bellflower, Bell Gardens, Cerritos, Commerce, Downey, Montebello, Pico Rivera and Norwalk. She Co-Chairs the Assembly Legislative Ethics Committee and is also a member of the Human Services, Judiciary, Natural Resources and Utilities and Commerce Committees. Recently, Cristina became part of Speaker Toni Atkins leadership team, when she was named as Assistant Whip to the Assembly Democratic Caucus. Cristina was an educator for thirteen years prior to joining the Assembly, Cristina taught statistics at the University of Southern California (USC), mathematics at Los Angeles City Community College, and has taught middle school and high school students through the Jaime Escalante Program at East Los Angeles Community College and Huntington Park High School. In this capacity she has taught and mentored thousands of people. She taught math to local high school students, served as a math advocate in South Los Angeles, tutored elementary students in Cudahy, worked with the Los Angeles Community College District to help students return to college and taught statistics at USC. As an educator, Cristina understands the damage bullying creates, on an emotional and physical level and stresses the importance of a healthy educational environment and community so that students can thrive. This inspired Cristina, last year, to author AB 256, Cyber-Bulling legislation that would give educators the authority to discipline students who engage in cyber bullying, harassment by electronic means, on or off the school campus. AB 256 was signed into law by Governor Brown in 2013. Cristina is a warrior for ethical conduct in local and state government, firmly believing that doing the right thing is worth the effort and that hard work pays off. When the City of Bell corruption scandal broke and gained national attention, Bell residents turned to Cristina and asked her to clean up their local government. She worked with them to form the Bell Association to Stop the Abuse (BASTA), a local advocacy organization that forced out Bell’s corrupt officials, and ushered in accountability and transparency for the first time in the city’s history. As a legislator, under a black cloud of corruption that hangs over the Capitol, Cristina introduced a wide ranging ethics and transparency bill package, the “Political Conduct, Ethics and Public Trust Acts of 2014,” to reform our political structure and help to restore the public’s trust in their government. Cristina is passionate in her efforts to empower women in politics and encourage the inclusion of women in both politics and government, while at the same time continuing to focus her energies on government accessibil­ity, accountability and transparency. Cristina was raised in the Southeast Los Angeles community of Bell Gardens and attended local public schools. She went on to earn a Bachelor’s Degree from Pomona College, a Master’s Degree and a Secondary teaching credential from Claremont Graduate University and is presently a doctoral candidate at USC. Cristina was recognized by California Forward with the distinguished California Forward Thinkers Award, Democrat of the Year and previously earned the Distinguished Woman of the Year Award from the California State Assembly.